We are leading Exporters and Suppliers of Portable Ultrasonic Flow Meters.The quality assured Portable Ultrasonic Flow Meters are known for being power efficient as well as highly reliable. 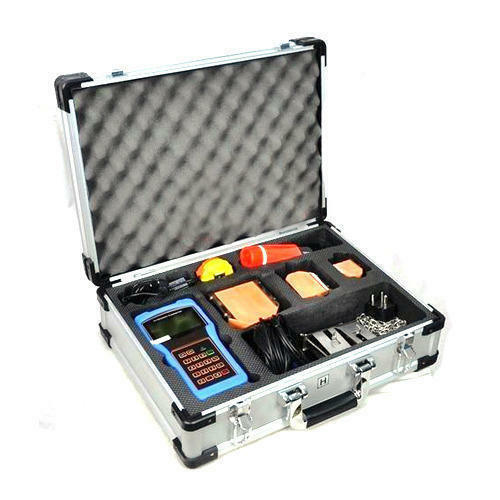 The accuracy and performance of the Portable Ultrasonic Flow Meters is widely appreciated. The Portable Ultrasonic Flow Meters are procured from the highly trusted sources and are genuine. The Portable Ultrasonic Flow Meters are accurately manufactured and have high durability. Fully weatherproof IP 68 rated Flow Computer, connectors and sensors. Extremely easy to install clamp-on sensors with no process interruption. Advanced signal transmission Noninvasive flow measurement of liquids, nopipeline disturbance, no pressure loss. Accuracy: Normally better than ±1% for velocity above 0.2m/s. We are leading manufacturer and supplier of Ultrasonic Flow Meter. Ultrasonic Flow Meter have been used in industry for over a long period of time for the volumetric flow metering of liquids as well as gasses. This method has been working successfully in industrial applications for more than 20 years. It is accurate and reliable. Besides measuring the volumetric flow rate, the method provides information on the type of liquid product based on the sound velocity that is measured in parallel. Ultrasonic flow measurement by the transit-time differential method is now one of the most universally applied flow metering processes to employ clamp on, non intrusive method in closed conduit and intrusive method by inserting probes on pipe. Open channel flow measurement is also done by ultrasonic transit time technique. The latest innovation of low-cost handheld Ultrasonic Flow Meter is one of the most useful flow meters available for liquid flow measurement. It employs state-of-the-art digital signal processing and clamp-on ultrasonic transit-time measurement technologies for accurate and reliable flow measurement non-intrusively from outside of a pipe. In this compact and light package, many built-in features make the flow meter an ideal tool for flow surveys (water, oil, chemicals, beverage, etc), HVAC and other closed-pipe applications.